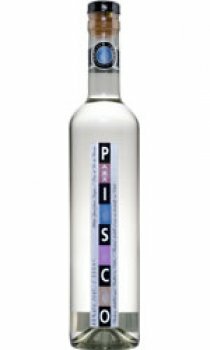 The proven existence of Pisco can be traced back to 1871, and its original Appellation of Origin was reserved and approved by law in 1931. Pisco ABA is produced in the heart of the Elqui Valley, a long narrow oasis that winds its way through the Andes. A "boutique" type of distillate made by the Aguirre family. Produced with double distillation in copper pot stills. You can drink Pisco ABA in a delicious Pisco Sour (Chileans' favourite cocktail), or mixed with Schweppes, Tonic Water or Ginger Ale (called "chuflay" in Chile), or simply neat on the rocks. Awarded: Gold Medal - VinItaly 2002; Silver Medal - International Wine & Spirit Competition 2002 (London); Double Gold Medal - The San Francisco World Spirits Competition 2004. I've ordered this drink a number of times from TheDrinkShop and I've been very happy with what I've received. Pisco Sour has become my drink of choice and there are plenty of recipes on the internet for you to try and you do not need much pisco in a drink so the bottle can potentially last a long time. Calm down everyone - Pisco comes from Chile and from Peru, and although the production practices differ, the childish arguments over Pisco's true birthplace are the same on both sides of the border. And Angostura bitters are an indispensable part of a Pisco Sour. For a sweet Pisco, the mix is: one of sour, two of sweet, three of strong, and four of weak (the ice). Add some egg white and a dash of bitters. Amazing. This Pisco is rubbish. It doesn't deserve to be called Pisco which is a city in Peru (The one which recently suffered the earthquake). Pisco is a Peruvian drink and this is a bad imitation. I really regret about buying this thing. Pisco is wonderful. I spent six months in Chile living on the stuff. A pisco sour, however, isn't pisco with angostura bitters. It is pisco with lemon juice and icing sugar (occasionally with egg white too but generally without)or at least that's how they make it in South America. A must-have for summer, something I bought on chance as I'd never seen it before. This is really great with lemonade or coke..but the ultimate cocktail we've come up with is... 2 parts Pisco 1 part Martini Extra Dry Dash tonic water Top up with Elderflower cordial. Shake well over ice. Ed - Thanks for the recipe.